Ninja who were disguised as bandits have kidnapped Kiri. As Genin, Boruto and the others are not originally meant to be given missions that involve fighting other ninja. 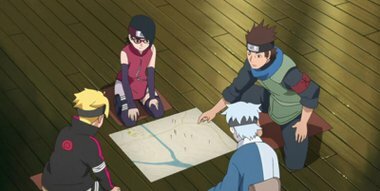 However, due to the pleading of the village and through Konohamaru’s judgement, Team 7 now has their mission changed from “Repelling Bandits” to “Rescue Kiri”.